Sulfur monoxide is an inorganic compound with formula SO. It is only found as a dilute gas phase. When concentrated or condensed, it converts to S2O2 (disulfur dioxide). It has been detected in space but is rarely encountered intact otherwise. The SO molecule has a triplet ground state similar to O2, i.e. each molecule has two unpaired electrons. The S−O bond length of 148.1 pm is similar to that found in lower sulfur oxides (e.g. S8O, S−O = 148 pm) but is longer than the S−O bond in gaseous S2O (146 pm), SO2 (143.1 pm) and SO3 (142 pm). The molecule is excited with near infrared radiation to the singlet state (with no unpaired electrons). The singlet state is believed be more reactive than the ground state triplet state, in the same way that singlet oxygen is more reactive than the triplet oxygen. The SO molecule is thermodynamically unstable, converting initially to S2O2. SO inserts into alkenes, alkynes and dienes producing molecules with three membered rings containing sulfur. In the laboratory sulfur monoxide can be produced by treating sulfur dioxide with sulfur vapour in a glow discharge. It has been detected in single bubble sonoluminescence of concentrated sulfuric acid containing some dissolved noble gas. Sulfur monoxide has been detected around Io, one of Jupiter's moons, both in the atmosphere and in the plasma torus. It has also been found in the atmosphere of Venus, in the Hale-Bopp comet and in the interstellar medium. Sulfur monoxide has been found in the largest star known, NML Cygni. Sulfur monoxide may have some biological activity, the formation of transient SO in porcine coronary artery has been inferred from the reaction products. Because of sulfur monoxide's rare occurrence in our atmosphere and poor stability; it is difficult to fully determine its hazards. But when condensed and compacted, it forms disulfur dioxide, which is relatively toxic and corrosive. 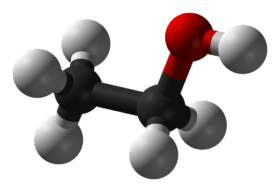 This compound is also highly flammable (similar flammability to methane) and when burned produces sulphur dioxide, a poisonous gas. SO converts to disulfur dioxide (S2O2). 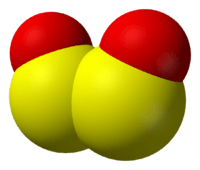 Disulfur dioxide is planar molecule with C2v symmetry. The S-O bond length is 145.8 pm, shorter than in the monomer, and the S-S bond length is 202.45 pm. The OSS angle is 112.7°. S2O2 has a dipole moment of 3.17 D.
↑ "sulfur monoxide (CHEBI:45822)". Chemical Entities of Biological Interest. UK: European Bioinformatics Institute. 1 2 3 4 Greenwood, Norman N.; Earnshaw, Alan (1997). Chemistry of the Elements (2nd ed.). Butterworth-Heinemann. ISBN 0-08-037941-9. ↑ A novel recyclable sulfur monoxide transfer reagent. Grainger RS, Procopio A, Steed JW. Org Lett. 2001 3(22), 3565-8. ↑ The temperatures of single-bubble sonoluminescence (A) Suslick K.S. and Flannigan D.J., The Journal of the Acoustical Society of America (2004) 116, 4, 2540. ↑ Io’s atmosphere: Not yet understood Lellouch, E. 1996. Icarus 124, 1–21. ↑ Kevin Marvel (19 December 1996). "NML Cygni". The Circumstellar Environment of Evolved Stars As Revealed by Studies of Circumstellar Water Masers. Universal-Publishers. pp. 182–212. ISBN 978-1-58112-061-5. Retrieved 23 August 2012.